Dominick's commitment to excellence is unmatched and his reputation as a teacher is impeccable. Former students have gone on to perform in some of the most prestigious rudimental drum gigs in the world including Walt Disney World, The Hellcats and The Old Guard. Jazz artists, college professors, rudimental drummers, hobbyists and more have made the pilgrimage to his studio in Bethlehem, Connecticut. It is never too early or late to start drumming, so whether you perform for a living or are just a beginner, Dominick can take you where you need to go. Call or email for more information and to develop a lesson plan that works for you. Skype lessons are available to drummers of all skill levels. 4. Contents are Flammable, for Steve Reich…learn, practice & perform! 6. Lets develop something TOGETHER! Dominick is available to join your students for a day (or more) of practice & preparation. Then when the work is done you can show off the end result with him joining your ensemble in concert. This can be a combination of music dating back to the American Revolutionary War, through the Civil War, into the Twentieth Century and Dominick's personal compositions. Lets pick the music, create the right program and bring your students & The Dreaded Drummer together! 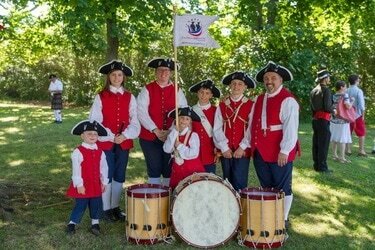 The Great American Fife & Drum Band is EVERYTHING that is great about the fife & drum activity. It is family, children, patriotism, music, education, entertainment, inspiration and more, all rolled up into one. This is a group you need to have perform at your event. Call Dominick to hire!